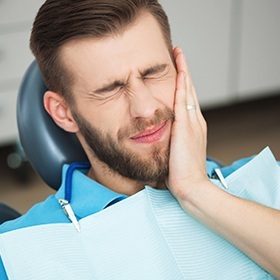 If you are in dental pain, and it is during office hours, give us a call at (405) 751-8092. We will see you today even if you are a new patient, as long as you can get here during our office hours. Or, if you have a broken tooth, a crown that came loose, or any other emergency - just call. Don't ignore dental pain! It's your body's signal that something is wrong. And, just because the pain goes away doesn't mean that the problem is gone. With an infected tooth, there is pain at first, but then the pulp tissue dies, and the pain may go away completely. Unfortunately, the infection is still there and will continue to spread and later cause a painful abscess. Don't ignore a toothache. Have it checked and find out if it needs attention. The longer you wait, the more complicated and expensive it gets to fix it! Often, people end up with a dental emergency because they have put off their dental care for so long. Sometimes emergencies come because life is unpredictable, sometimes because of finances, and sometimes because of dental fear. Whatever your reason for putting off your dental care, we want you to know that Dr. Swearingen will not make you feel guilty or embarrassed. He does not judge his patients and is just glad they are now getting the care they need. It is not uncommon for a patient to end up with a dental emergency because they have had a negative experience with a dentist. We are sensitive to that and want to give our patients a pain-free experience. We start that even with our injections. Rather than a typical needle injection, we use a relatively new approach called The Wand, which gives pain-free injections. You can learn more about that and our nitrous oxide sedation on our technology page. A toothache : If the pain is coming from inside the tooth, that is almost always a sign that the pulp is being irritated in some way. This can happen due to an infection or a cavity. An infection : You can get an infection in or around your tooth. Antibiotics alone will not solve a dental infection because there is no way for the antibiotics to get inside your tooth. If the infection requires a root canal treatment, we will not do that procedure at the emergency appointment. Instead, we'll get you out of pain and set up a follow-up appointment for any further treatment that is necessary. A broken tooth : Though broken teeth may not cause pain, they can be an aesthetic emergency. Go ahead and come in and we can bond your tooth back together. Direct bonding is a relatively quick procedure and will save you the embarrassment of smiling with broken teeth. A tooth that's been knocked out : When you've received a traumatic injury that causes one of your teeth to come out completely, it is important to be seen right away. Place the tooth in either milk or a moist (not dripping wet) towel. This will keep the ligament alive and may allow us to replant and save the tooth (depending on how fast you can get here!). If you have a dental emergency, call now. We'll see you right away!